As has often happened this year, I selected this book because of one of the readers...because, yes, I was in the mood for yet another audiobook (and I'm on hold, still, for Harry Potter and the Prisoner of Azkaban). The blurb for this one sounded sweet, and my Goodreads buddies seemed to like it so I gave it a whirl. The blurb synopsis is pretty straight forward. There is Otto who kicks off the story, stumbling upon three sisters after getting lost in the woods. 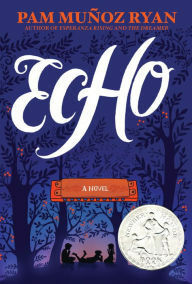 Then there is Friedrich, a talented musician growing up in Germany at the beginning of WWII; Mike, an orphan in Pennsylvania trying desperately to find a future for himself and his brother; and Ivy, a young girl facing prejudice in Southern California just after the bombing of Pearl Harbor. Weaving throughout each of their stories is a simple harmonica and the power of music. The story is crafted beautifully. Each story is cut short (at fairly decent cliffhangers) before being revisited in the end and coming together in a very hopeful, believable (if not overly tidy) way. While on the outset I thought there was going to be a solid magical realism vibe with a witch and a curse, that storyline sticks pretty closely to Otto's initial introduction to the sister's at the beginning of the book. There are touches of here and there as each child finds and plays the harmonica, but that only serves to tie them together and weave a reverence for music throughout. This is definitely a children's book. While the author is masterful enough not to condescend to younger readers, it is a very clean read with a bow tied neatly around the end. While they face challenges along the way, every character has a very happy ending. And that's okay. I've made no secret of the fact that I tend to like people to die in stories (I'm really a very gentle person, I promise! ), I was okay with this very pretty bow. The audiobook is fantastic, by the way. There is music played throughout and the narrators even do a little singing. I'm a big fan of Rebecca Soler in particular. She was fantastic narrating the Lunar Chronicles series by Marissa Meyer and equally impressive in Echo. It is very likely that I will explore the other offerings by Pam Munoz Ryan.